St. John's ( , French: Saint-Jean) is the provincial capital of Newfoundland and Labrador , Canada and located on the eastern tip of the Avalon Peninsula on the island of Newfoundland . St. John's is the most populous Census Metropolitan Area (CMA) in the province, it is the second largest CMA in the Atlantic Provinces after Halifax , and 20th Largest metropolitan area in Canada with a population of 185,288. The city enjoys a long and vibrant history as the oldest English-founded city in North America. The St. John's CMA is the fastest growing metropolitan area in Newfoundland and Labrador and Atlantic Canada as well as the 19th fastest growing CMA in Canada. The CMA includes the neighbouring city of Mount Pearl and eleven other towns, the largest of which are Conception Bay South and Paradise . St. John's harbour was a frequent haven for European fishermen throughout the early 1500s, and was officially established as a community when Sir Humphrey Gilbert declared Newfoundland an English colony in 1583. While the origin of the name St. John's is not definitively known, its first usage appears in a Portuguese map as "Rio de San Johem" by 16th century Portuguese cartographer Pedro Reinel (? – c.1542). The popular origin of the name, however, is said to have originated from the Italian discoverer Giovanni Caboto, who landed in Bonavista on 24 June 1497. With a long and prosperous history in the fishery industry, the last half of the 20th century has seen St. John's transformed into a modern export and service centre, famed for its nightlife and rich musical culture. More recently, its proximity to recently discovered oil fields has led to an economic boom that has spurred population growth, commercial development and has resulted in the St. John's area now accounting for about half of the province's economic output. St. John's is the oldest English-founded settlement in North America. Tradition declares that the city earned its name when explorer John Cabot became the first European to sail into the harbour, on June 24, 1497 — the feast day of Saint John the Baptist. However, the exact locations of Cabot's landfalls are disputed. A series of expeditions to St. John's by the Portuguese in the Azores followed in the early 16th century, and by 1540 French, Spanish and Portuguese ships crossed the Atlantic annually to fish the waters off the Avalon Peninsula . In the Basque Country , it is a common belief that the name of St. John's was given by Basque fishermen because the bay of St. John's is very similar to the Bay of Pasaia in the Basque Country, where one of the fishing towns is also called St. John (in Spanish, San Juan). The earliest record of the location appears as São João on a Portuguese map by Pedro Reinel in 1519. When John Rut visited St. John's in 1527 he found Norman, Breton and Portuguese ships in the harbour. On August 3, 1527, Rut wrote a letter to King Henry on the findings of his voyage to North America; this was the first known letter sent from North America. St. Jehan is shown on Nicholas Desliens' world map of 1541 and San Joham is found in João Freire's Atlas of 1546. It was during this time that Water Street was first developed, making it the oldest street in North America. 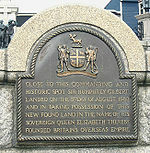 On August 5, 1583, Sir Humphrey Gilbert claimed the area as England 's first overseas colony under Royal Charter of Queen Elizabeth I. At the time, he found 16 English ships with 20 French and Portuguese vessels using the harbour; at the time, settlement had developed on the north side of the harbour. There was no permanent English settler population, however, and Gilbert was lost at sea during his return voyage, thereby ending any immediate plans for settlement. The Newfoundland National War Memorial is located on the waterfront in St. John's, at the purported site of Gilbert's landing and proclamation. By 1620 the fishermen of England's West Country had excluded other nations from most of the east coast. In 1627, St. John's was "the principal prime and chief lot in all the whole country". The resident population grew slowly in the 17th century, but St. John's was by far the largest settlement in Newfoundland when English naval officers began to take censuses around 1675. Every summer the population swelled with the arrival of migratory fishermen. In 1680, fishing ships (mostly from South Devon ) set up fishing rooms at St. John's, bringing hundreds of Irish men into the port to operate inshore fishing boats. The town's first significant defenses were probably erected due to commercial interests, following the temporary seizure of St. John's by the Dutch admiral Michiel de Ruyter in June 1665. Regardless of the identity of those who built the defenses, the inhabitants were able to fend off a second Dutch attack in 1673. The British government began to plan fortifications around 1689, and these were constructed following the retaking of St. John's after the French admiral Pierre Le Moyne d'Iberville captured and destroyed the town late in 1696. The French attacked St. John's again in 1705 and 1708, and devastated civilian structures with fire. The harbour remained fortified through most of the 18th and 19th century. The final battle of the Seven Years' War in North America (the French and Indian War) was fought in 1762 in St. John's at the Battle of Signal Hill , in which the French surrendered St. John's to the British under the command of Colonel William Amherst. The eighteenth century saw major changes in Newfoundland: population growth, beginnings of government, establishment of churches, reinforcement of commercial ties with North America and development of the seal, salmon and Grand Banks fisheries. St. John's grew slowly, and although it was still primarily a fishing station, it was also a garrison, a centre of government and, increasingly, a commercial hub. St. John's served as a naval base during both the American Revolutionary War and the War of 1812. Shanawdithit, the last known individual of Newfoundland's indigenous Beothuk people, died in a St. John's hospital of tuberculosis in 1829. Guglielmo Marconi received the first transatlantic wireless message in St. John's on December 1901 from his wireless station in Poldhu , Cornwall . St. John's was the starting point for the first non-stop transatlantic aircraft flight, by Alcock and Brown in a modified Vickers Vimy IV bomber, in June 1919, departing from Lester's Field in St. John's and ending in a bog near Clifden , Connemara, Ireland . In July 2005, the flight was duplicated by American aviator and adventurer Steve Fossett in a replica Vickers Vimy aircraft, with St. John's International Airport substituting for Lester's Field (now an urban and residential part of the city). During the Second World War, the harbour was used by Royal Navy and Royal Canadian Navy ships used for protecting convoys. It was also the site of a large US Army base called Fort Pepperrell . This base was established as part of the "Lend-Lease" agreement between the UK and USA. The city is located on the northeast coast of the Avalon Peninsula in southeast Newfoundland , and on the Atlantic Ocean . It is the most easterly city in North America excluding Greenland ,as well as the second largest city in Atlantic Canada after Halifax , Nova Scotia . The downtown area lies to the north of St. John's Harbour, and the rest of the city expands uphill to the west, north, and east. The native vegetation is dominated by coniferous trees such as black spruce, white spruce, and balsam fir. The largest deciduous tree is white birch ; species of lesser stature include alder, cherry and mountain ash. Introduced trees often seen in lawns and parks include Norway maple, sycamore maple, common horsechestnut, European beech and littleleaf linden. Soils in the area tend to be stony and shallow. They also are strongly acidic in most cases, and have pale leached topsoils typical of podzols. Often the topsoils are much finer-textured than the parent material (atypical for podzols). St. John's is known as "Canada's Weather Champion" this is because of all major cities in Canada , St John's is the cloudiest (only 1,497 hours of sunshine a year), snowiest (359 cm; 11.8 ft), windiest (24.3 km/h average speed) and has the most wet days per year (Environment Canada, 2005). However, St. John's has the third mildest winter in comparison to other Canadian cities.Environment Canada, http://atlantic-web1.ns.ec.gc.ca/climatecentre/default.asp?lang=En&n=83846147-1#champion St. John's has a humid continental climate (Dfb) with cool-to-warm summers, and relatively mild winters for Canada (cold by a world standard). Average highs and lows are 20 °C (68 °F)/10 °C (50 °F) in July and -1 °C (30 °F)/-8 °C (17 °F) in January. The annual precipitation is moderate to high, with an average of 1,640 millimetres (64.6 in) per year. The city is also one of the areas of the country most prone to tropical cyclone activity, as it is bordered by the Atlantic Ocean to the east, where tropical storms (and sometimes hurricanes) travel. Temperature and Precipitation data recorded at St. John's International Airport by Environment Canada. Data spans 1971 to 2000. Sunshine hours recorded at St. John's West CDA by Environment Canada. Data spans 1971 to 2000. The architecture of St. John's has a flavour distinct from that of the rest of Canada, and its major buildings are remnants of its history and prestige as one of the first British colonial capitals. Buildings took a variety of styles according to the styles and means available to build the structures. Starting as a fishing outpost for European fishermen, St. John's consisted mostly of the homes of fishermen, sheds, storage shacks, and wharves. Of course, these structures were small and constructed out of wood. Like many other cities of the time, as the Industrial Revolution took hold and new methods and materials for construction were introduced, the landscape changed as the city grew in width and height. The Great Fire of 1892 destroyed most of the downtown core, and most residential and other wood-frame buildings date from this period. Often compared to San Francisco because of its hilly terrain and steep maze of residential streets, housing in St. John's is typically painted in bright colours, unlike most other parts of Canada. The information below is from the 2006 Canadian Census. The population of the City of St. John's was estimated to be 100,646 in 2006, while the St. John's Census Metropolitan Area , which comprises of 12 other communities, had a population of 181,113. In 2007, St. John’s CMA recorded the largest population increase of all CMAs in Atlantic Canada driven by intraprovincial migration. By 2008 the population was estimated at 185,288. The information below is from the 2001 Canadian Census. Overwhelmingly Christian, the population of St. John's was once divided along sectarian (Catholic/Protestant) lines. In recent years, this sectarianism has declined significantly, and is no longer a commonly acknowledged facet of life in St. John's. St. John's is the seat of the Roman Catholic Archbishop of St. John's , and the Anglican Bishop of Eastern Newfoundland and Labrador . Many of the earliest settlers of St. John's came from the southwest of England , especially the West Country and Devon in particular, and southeast Ireland , primarily Waterford , Wexford and Kilkenny . These origins can still be detected in similarities between the original dialects of each of these regions and the traditional St. John's accent. St. John's has continuously had one of the lowest crime rates in Canada. Policing services are provided by the Royal Newfoundland Constabulary, which serves as the primary policing body of the metropolitan area . The B Division headquarters of the Royal Canadian Mounted Police , which serves the rest of Newfoundland and Labrador , is located in the Pleasantville neighbourhood in the city's east end.According to Statistics Canada's Juristat reports (1993-2007), the metropolitan area reports an average homicide rate of approximately 1.15 per 100,000 population; an average of two homicides per year. An all-time high rate of 2.27 was reported in 1993 (four homicides). This figure is far below the national average and ranks amongst the lowest rates for any metropolitan area in Canada. Overall crime rate is 22% below the national average, which ranks St. John's as the 46th most dangerous city in Canada out of 100. St. John's economy has been continuously connected both to its role as the provincial capital of Newfoundland and Labrador and to the ocean. Today, its continued growth is as much tied to what lies beneath the ocean – oil and gas – as what swims in or travels across the ocean. The city's economy is growing quickly, and the city has been identified as having one of the highest proportion of scientists and engineers per capita of any city under one million population in North America. Economic forecasts suggest that the city will continue its strong economic growth in the coming years not only in the "oceanic" industries mentioned above, but also in tourism and new home construction as the population continues to grow. St. John's is also becoming known as an entrepreneurial citiy, in a 2009 report by the Canadian Federation of Independent Business; Communities in Boom: Canada’s Top Entrepreneurial Cities, St. John's was ranked the best major city in Atlantic Canada , and 19th overall in Canada for providing a good environment for small business development. The Provincial Museum of Newfoundland and Labrador (c. 1892-3) was located on Duckworth Street, the building is listed on the Canadian Register of Historic Places. In 2005 the Provincial Museum of Newfoundland and Labrador, the Art Gallery of Newfoundland and Labrador and the Provincial Archives of Newfoundland and Labrador, moved into The Rooms , Newfoundland and Labrador 's cultural facility, which located in the downtown area. The Railway Coastal Museum is a transportation museum located in the 104 year old Newfoundland and Labrador train station building on Water Street . The Johnson Geo Centre is a geological interpretation centre located on Signal Hill. The centre is designed to teach the public about the history of the earth through the unique and complex geological history of Newfoundland and Labrador. St. John's has over 400 locally owned and franchised restaurants. In the downtown area on Water Street and Duckworth Street, there are numerous shops, restaurants and historic buildings. George Street , which is a side-street above the western end of Water Street . The street is believed to have the most pubs and bars per square foot of any street in North America, and is known to have bars that are open later than most others throughout most of Canada. George Street holds numerous festivals throughout the year including the George Street Festival and the annual Mardi Gras festival in October, the street can be busy on nearly any night of the week. Pippy Park is an urban park located in the east end of the city, with over 3,400 acres of land Pippy Park is one of Canada‘s largest urban parks. The Park contains a range of recreational facilities including two golf courses, Newfoundland and Labrador 's largest serviced campground, walking and skiing trails as well as protected habitat for many plants and animals.Pippy Park is also home to the Fluvarium , an environmental education centre which offers a cross section view of Nagle's Hill Brook. Bowring Park , is located in the Waterford Valley and is one of the most scenic parks in St. John's. Entrance to the park is via Waterford Bridge Road, passing a sculptured duck pond and a statue of Peter Pan. The park land was donated to the city in 1911 by Sir Edgar Rennie Bowring on behalf of Bowring Brothers Ltd. on their 100th anniversary of commerce in Newfoundland. The park was officially opened by His Royal Highness, the Duke of Connaught. Bannerman Park , located near downtown is a Victorian-style urban park. The park was officially opened in 1891 by Sir Alexander Bannerman, Governor of the Colony of Newfoundland who donated the land to create the park. Today the park contains a public swimming pool, playground, a baseball diamond and many large open grassy areas. Bannerman Park plays host to many festivals and sporting events, most notably the Newfoundland and Labrador Folk Festival and St. John's Peace-a-chord and is also the finishing location for the annual Tely 10 road race. Signal Hill is a hill which overlooks the city of St. John's. It is the location of Cabot Tower which was built in 1897 to commemorate the 400th anniversary of John Cabot's discovery of Newfoundland, and Queen Victoria's Diamond Jubilee. The first transatlantic wireless transmission was received here by Guglielmo Marconi on December 12, 1901. Today, Signal Hill is a Canadian National Historic Site and remains incredibly popular amongst tourists and locals alike; 97% of all tourists to St. John's visit Signal Hill. Amongst its popular attractions are the Signal Hill Tattoo, showcasing the Royal Newfoundland Regiment of foot, circa 1795, and the North Head Trail which grants an impressive view of the Atlantic Ocean and the surrounding coast. St. John's was the home of the St. John's Fog Devils, a junior hockey team in the QMJHL that played at Mile One Centre from 2005–2008. The team left town after just three seasons due to many reasons, notably a poor lease arrangement with the city over the use of Mile One Centre and attendance problems. The St. John's Maple Leafs of the AHL played in St. John's from 1990–91 until the 2004–2005 season, first at Memorial Stadium and then at Mile One Centre , after which they relocated to Toronto, Ontario and became the Toronto Marlies. St. John's is home to North America's oldest annual sporting event, the Royal St. John's Regatta, which dates back to at least 1816. The event is considered important enough in the life of the city that the day of the Regatta (the first Wednesday with fine weather in August) is a civic holiday — one of the few weather-dependent holidays in the world. Bannerman Park in St. John's is the location of the finish line for the Tely 10, one of the oldest road races in Canada . St. John's played host to the Canada Men's Soccer team's first (and only) qualification for the FIFA World Cup on September 14, 1985 where they defeated Honduras 2-1, at King George V Park . The park also played host to a FIFA World Cup Qualification game on August 20, 1972, where Canada beat USA 3-2. Canada, however, failed to qualify for the World Cup in 1974. Rugby union is a popular sport in St. John's. The current Rugby Canada Super League champions for 2005 & 2006 were the Newfoundland Rock who play at Swilers Rugby Park in St. John's. The city was also host to a Rugby World Cup qualifying match between Canada and the USA on 12 August 2006, where the Canadians heavily defeated the USA 56-7 to qualify for the 2007 Rugby World Cup finals in France. The 2007 age-grade Rugby Canada National Championship Festival was held in the city. The 2005 Scott Tournament of Hearts, the Canadian women's curling championship, was held at Mile One Centre in St. John's, Newfoundland and Labrador from February 19 to 27, 2005. The 2006 Olympic gold medalist men's curling team, skipped by Brad Gushue, is based in St. John's. Professional and WWE wrestler Ed "Sailor" White was born in St. John's. The St. John's City Hall is located on New Gower Street, it was designed by Parkin Associates of Toronto and was officially opened in 1970 to house municipal offices and Council Chambers.The city council has a partial ward system with a Mayor, Deputy Mayor, five ward councillors and four councillors at large. The current mayor of the city is Dennis O'Keefe. O'Keefe was elected mayor in a by-election in June 2008. Municipal elections in St. John's are held every four years on the last Tuesday in September. The last election was held on September 29, 2009 and Dennis O'Keefe was re-elected mayor for another four years. Due to St. John's being the capital city of Newfoundland and Labrador the provincial legislature is located in the city. The Confederation Building , which is located on confederation hill is home to the House of Assembly along with the offices of the MHA's and Ministers. The city is represented by seven MHA's, six who are members of the governing Progressive Conservative Party, and one seat that belongs to New Democratic Party leader Lorraine Michael, who has the only NDP seat in the province. St. John's is represented by two Members of Parliament; St. John's South—Mount Pearl MP, Liberal Siobhán Coady and St. John's East MP, New Democrat Jack Harris. The Newfoundland and Labrador office for the regional federal minister is located in downtown St. John's. Regional offices for Federal Government Departments and Agencies are also located throughout the city. St. John's is the eastern terminus of the Trans-Canada Highway. Victoria, British Columbia is the western terminus. The divided highway, also known as "Outer Ring Road" in the city, runs just outside the main part of the city, with exits to Pitts Memorial Drive, Topsail Road, Team Gushue Highway, Thorburn Road, Allandale Road, Portugal Cove Road and Torbay Road, providing access to the neighbourhoods of those streets relatively easy. Pitts Memorial Drive runs from Conception Bay South , through the city of Mount Pearl and into downtown St. John's, with interchanges for the Goulds, Water Street and Hamilton Avenue-New Gower Street. Pitts Memorial Drive has been criticized for less-than-ideal road conditions. The Parkway is another major thoroughfare in the city. Phase one of the St. John's Cycling Master Plan was officially launched in July 2009. The first phase with the support of $1.5 million from the Newfoundland and Labrador Green Fund, will consist of 43 kilometres of on-road painted bike lanes, signs on an additional 73 kilometres of roadway, the installation of 20 bicycle parking facilities and the addition of bike racks on the fleet of 53 Metrobuses. The city's aviation needs are served by St. John's International Airport . The airport is located northwest of the city and airlines include Air Canada, Air Canada Jazz, Air Labrador, Air Saint-Pierre, Air Transat, CanJet, Continental Airlines, Porter Airlines, Provincial Airlines, Skyservice, Sunwing Airlines and Westjet. In 2005 St. John's International Airport was the eleventh busiest airport In Canada. The city's public transportation system is Metrobus. Metrobus has a total of 18 routes, 778 bus stops, 68 bus shelters, 54 buses and an average weekday ridership of 14,815. Destinations include the Avalon Mall , The Village Shopping Centre , Churchill Square, downtown St. John's, Pearlgate Plaza, Torbay Road Mall, Stavanger Drive Business Park , Mount Pearl Square, Kelsey Drive, Airport Heights, the Goulds, Kilbride, Shea Heights, Mile One Centre , Memorial University , Academy Canada, the College of the North Atlantic , the Marine Institute , the Confederation Building , City Hall the four hospitals in the city as well as other important areas in the St. John's and Mount Pearl . St. John's was the eastern terminus of the Newfoundland Railway until the abandonment and closure of the railway in September 1988. St. John's is served by the Eastern School District, the largest school district in Newfoundland and Labrador by student population. There are currently 36 primary, elementary and secondary schools in the city of St. John's, including three private schools and the Newfoundland School for the Deaf. St. John's also includes one school that is part of the province-wide Conseil Scolaire Francophone (CSF), the Francophone public school district. It also contains two private schools, St. Bonaventure's College and Lakecrest Independent. One major public university operates in St. John's, Memorial University of Newfoundland (MUN), which provides comprehensive education and grants degrees in several fields. The Fisheries and Marine Institute of Memorial University of Newfoundland (MI) or simply Marine Institute, is a post-secondary ocean and marine polytechnic located in St. John's and is affiliated with Memorial University of Newfoundland. The College of the North Atlantic (CNA) is the public college of the province and operates two main campuses within the city. CNA provides career, trade, and university-transfer programs for St. John's residents. The city also hosts a number of private colleges and post-secondary schools; Academy Canada, CompuCollege, and Keyin College comprise the largest of these schools. St. John's is currently the only Canadian city served by radio stations whose call letters do not all begin with the letter C. The ITU prefix VO was assigned to the Dominion of Newfoundland before the province joined Canadian Confederation in 1949, and three AM stations kept their existing call letters. However, other commercial radio stations in St. John's which went to air after 1949 use the same range of prefixes (CF–CK) currently in use elsewhere in Canada, with the exception of VOCM-FM, which was permitted to adopt the VOCM callsign because of its corporate association with the AM station that already bore that callsign. VO also remains in use in amateur radio. St. John's is served by several local papers. The main paper is The Telegram, which is Newfoundland and Labrador's largest daily newspaper and the only daily local newspaper for the city. Others includeThe Muse, The Gazette, Le Gaboteur, The Scope, and The Current. St. John's also receives the nationally distributed newspapers The Globe and Mail and the National Post. Channel 6 — CJON , independent station which airs a mix of Global programming and news programming from CTV using the brand NTV.